A Dublin football club is planning to turn one of the capital's most neglected areas into a bustling metropolis. In a highly ambitious proposal, St Patrick's Athletic FC has drawn up plans for a major development at St Michael's Estate in Inchicore. In association with HRS International, the development will include a state-of-the-art shopping centre with leisure facilities. However, what sets this project apart is that a football stadium, suitable for 12,000 spectators, will lie on top of these amenities. New housing units will also be included within the locality if Dublin City Council approves the plan. Speaking to the Herald, St Patrick's Athletic president Tom O'Mahony said: "It sounds like science-fiction, but there are quite few examples of developments like this in Europe. "In the basement you will have parking space for 350 cars, then above that will be the retail town centre, then above that, on the first floor, will be where the football stadium will be located. "The houses, which will most likely be apartments, will be situated between the cemetery and stadium on Emmet Road. "Obviously, there's a national housing crisis at the moment so Inchicore would be a great place to build new homes." The plan, which is being led by Garrett Kelleher of St Patrick's Athletic, claims it can accommodate whatever housing density and mix is required by Dublin City Council. It says it will also provide the area with major retailers and leisure facilities, in addition to civic and community facilities. The proposed Uefa Category Three stadium, with 12,000 covered seats and modern facilities, would be designed by leading architect David Mizrahi of HRS International. Mr Mizrahi has been responsible for stadiums across Europe and was also the lead architect with Santiago Calatrava on the Samuel Beckett and James Joyce bridges in Dublin. The club believes the stadium development will be financially independent and will not be reliant on receiving any Government grants. The stadium is expected to be independently managed and will serve as a venue for St Patrick's Athletic FC and "many other uses which will be an asset to Inchicore and indeed to Dublin as a whole". "We believe our proposal is a game-changer for Inchicore and, of course, for our club. 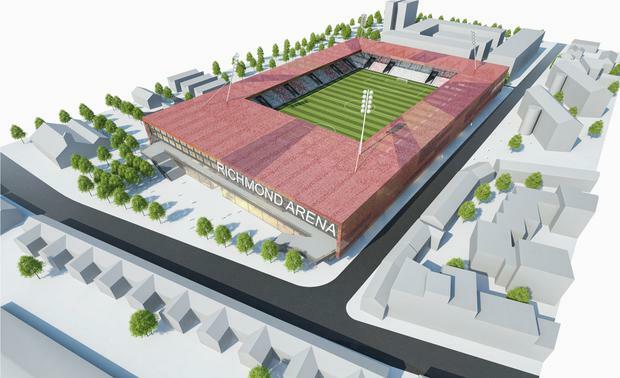 It would give our supporters an ultra-modern stadium which would also be suitable for a wide range of community events," Mr O'Mahony added. "It would transform Inchicore and would realise the City Council's vision of a vibrant, high-quality urban quarter. "We will now engage with the City Council to discuss our plans and we hope to have an opportunity to play a leading role in the regeneration of our neighbourhood." He said that if planning permission is granted, the development could be built as early as 2020. However, there has been no indication of cost. "Its completion, which will be project managed by FESP International Ltd, will take approximately two years from when planning permission is granted," he added.